Mobile wireless communication system has gone through several evolution stages in the past few decades after the introduction of the first generation mobile network in early 1980s. Due to huge demand for more connections worldwide, mobile communication standards advanced rapidly to support more users. Let’s take a look on the evolution stages of wireless technologies for mobile communication. Marconi, an Italian inventor, transmitted Morse code signals using radio waves wirelessly to a distance of 3.2 KMs in 1895. It was the first wireless transmission in the history of science. Since then, engineers and scientists were working on an efficient way to communicate using RF waves. Telephone became popular during the mid of 19th century. Due to wired connection and restricted mobility, engineers started developing a device which doesn’t requires wired connection and transmit voice using radio waves. Martin Cooper, an engineer at Motorola during 1970s working on a handheld device capable of two way communication wirelessly, invented the first generation mobile phone. It was initially developed to use in a car, the first prototype was tested in 1974. This invention is considered as a turning point in wireless communication which led to an evolution of many technologies and standards in future. The first generation of mobile network was deployed in Japan by Nippon Telephone and Telegraph company (NTT) in Tokyo during 1979. In the beginning of 1980s, it gained popularity in the US, Finland, UK and Europe. This system used analogue signals and it had many disadvantages due to technology limitations. Second generation of mobile communication system introduced a new digital technology for wireless transmission also known as Global System for Mobile communication (GSM). 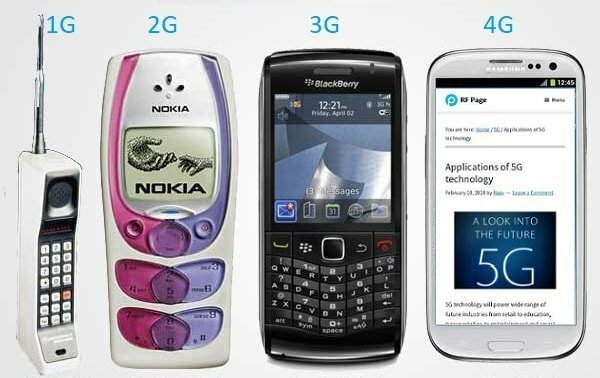 GSM technology became the base standard for further development in wireless standards later. This standard was capable of supporting up to 14.4 to 64kbps (maximum) data rate which is sufficient for SMS and email services. Code Division Multiple Access (CDMA) system developed by Qualcomm also introduced and implemented in the mid 1990s. CDMA has more features than GSM in terms of spectral efficiency, number of users and data rate. In order to support higher data rate, General Packet Radio Service (GPRS) was introduced and successfully deployed. GPRS was capable of data rate up to 171kbps (maximum). EDGE – Enhanced Data GSM Evolution also developed to improve data rate for GSM networks. EDGE was capable to support up to 473.6kbps (maximum). Another popular technology CDMA2000 was also introduced to support higher data rate for CDMA networks. This technology has the ability to provide up to 384 kbps data rate (maximum). 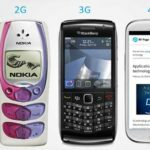 Third generation mobile communication started with the introduction of UMTS – Universal Mobile Terrestrial / Telecommunication Systems. UMTS has the data rate of 384kbps and it support video calling for the first time on mobile devices. After the introduction of 3G mobile communication system, smart phones became popular across the globe. Specific applications were developed for smartphones which handles multimedia chat, email, video calling, games, social media and healthcare. In order to enhance data rate in existing 3G networks, another two technology improvements are introduced to network. HSDPA – High Speed Downlink Packet access and HSUPA – High Speed Uplink Packet Access, developed and deployed to the 3G networks. 3.5G network can support up to 2mbps data rate. 3.75 system is an improved version of 3G network with HSPA+ High Speed Packet Access plus. Later this system will evolve into more powerful 3.9G system known as LTE (Long Term Evolution). 4G systems are enhanced version of 3G networks developed by IEEE, offers higher data rate and capable to handle more advanced multimedia services. 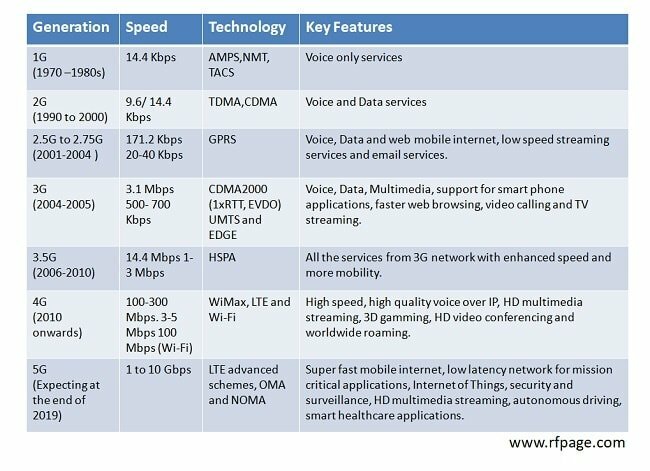 LTE and LTE advanced wireless technology used in 4th generation systems. Furthermore, it has compatibility with previous version thus easier deployment and upgrade of LTE and LTE advanced networks are possible. Simultaneous transmission of voice and data is possible with LTE system which significantly improve data rate. All services including voice services can be transmitted over IP packets. Complex modulation schemes and carrier aggregation is used to multiply uplink / downlink capacity. Wireless transmission technologies like WiMax are introduced in 4G system to enhance data rate and network performance. 5G will be using advanced technologies to deliver ultra fast internet and multimedia experience for customers. 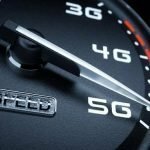 Current LTE advanced networks will transform into supercharged 5G networks in future. In order to achieve higher data rate, 5G technology will use millimeter waves and unlicensed spectrum for data transmission. Complex modulation technique has been developed to support massive data rate for Internet of Things. Cloud based network architecture will extend the functionalities and analytical capabilities for industries, autonomous driving, healthcare and security applications. Wireless technology has been continuously evolving to meet increasing demands and higher specification requirements. Since the deployment of first generation mobile networks, telecommunication industry facing lot of new challenges in terms of technology, efficient utilization of spectrum and most importantly security to end users. Future wireless technologies will provide ultra fast, feature rich and highly secure mobile networks.